Easily cut out pieces of MP3 files without having to decode that MP3. DeltaWalker Oro, Pro and Standard are available in the ZotShop! MP3 Splitter for Mac is an easy audio splitting software that is allows you to quickly and easily cut your MP3 audio file on Mac without the need for re-encoding, all in a single, easy-to-use interface. The tool cuts the MP3 at the frame level without losing the quality of your MP3. so it keeps the sound quality of original MP3 files. The program can easily cut off any number of fragments you need. It supports automatically splitting by selection, time, file size or number of parts. It supports splitting MP3 files with automatic silence detection. Remove unwanted portions of your MP3 files with ease. 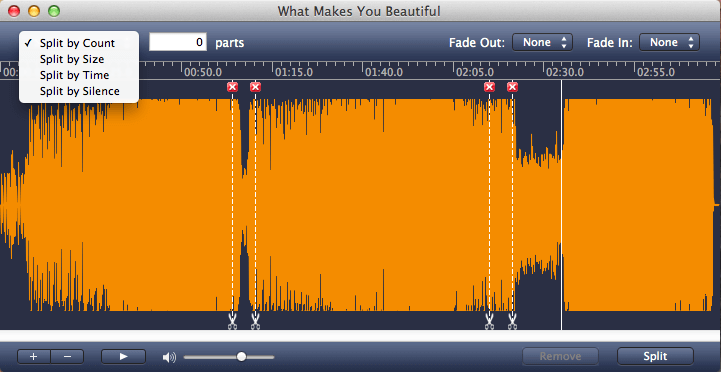 AppleMacSoft MP3 Splitter for Mac allows you to easily add fade-in and fade-out effects to output audio files. The MP3 Splitter program provided by AppleMacSoft is so easy to use that beginners can effectively cut their favorite parts from MP3 songs to use as ringtones. It is also useful for splitting audiobooks, or audio tapes into separate tracks, cutting unwanted parts, and removing unnecessary (silence, noise, etc.) segments. The built-in CUE Splitter lets you split a large audio file. Easily split larger MP3 into multiple tracks without reducing quality. Easily remove unwanted portions of your MP3 files. The silence detector lets you split an audiobook into chapters or remove unwanted silence from your Audio files. Drag and drop an audio file directly onto the application. Easily move split points by dragging them exactly where you would like, or add by timestamp. The splitting speed is unbelievably fast. This is the same price as the vendor is selling it for. Should be 50% off $9.95. The price as the vendor of MP3 Splitter for Mac is $19.95 USD, you can view it in shop basket.